Jaywalker update, check it out... I love this STR colorway (as a "Rare Gem" it's a one of a kind colorway, lucky me)!!! 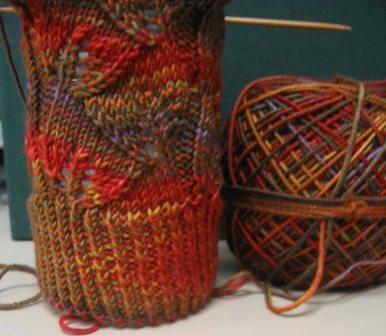 I took a leap, and started knitting two socks on one needle using the magic loop method. This worked great! 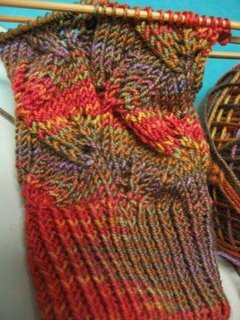 I am doing heel flaps on these socks, and did fine knitting both flaps using the magic loop, but had to start doing one at a time for turning the heel and picking up gusset stitches. They are now resting comfortably on two-circs since my one needle is too short to deal with heel gussets, I typically do a short row heel, so I'm really pushing myself outside of my very, very comfy box! Anyway, they'll find their way back to one circ after the gusset decreases! 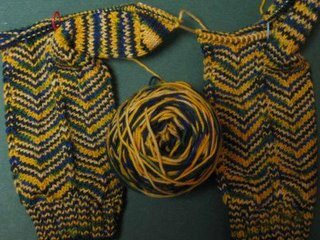 My feet are talking to me (don't ask) and they said, "why don't you make me some of those leafy socks yer friend is making?" Thanks, NK, thanks a bunch - now I HAVE to make those, or I will one pissed off pair of feet! Seriously, though, I bow to you, the queen of all things sockly. Yarn is BEAUTIFUL - what color is it?